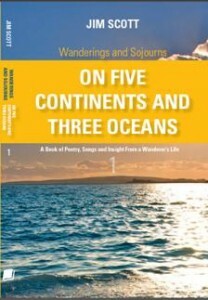 Written as the first of the “Wanderings and Sojourns” series, this book serves as an introduction to the series. It comprises 24 true stories from around the world based upon the author’s own experiences and adventures but, unlike most books of its kind, adds pause for philosophical reflection at the end of each. Also included are many works of lyrical verse complimenting the stories, several of which are included in the much larger collection of songs and verses in book 3. As with all the books in the series this one covers many disparate themes from a wanderer’s unusual life. 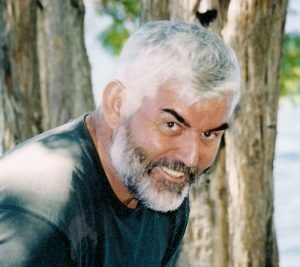 Book 1 embraces African insurgent war, hiking the Peruvian Andes, meeting poverty in India, sailing the Caribbean, Moroccan hospitality, shipwreck in Portugal, Aboriginal spirituality and much more. Available at selected book stores; on-line from Friesen Press, Amazon, Chapters, Indigo, Barnes and Noble and in Kindle. To actually sit down and put it together …. not long because most of the stories were already written in one form or another. But to do the research you could say that because the earliest story is about a pre-teen experience …. it has taken me 50 years. From where does the inspiration come for the stories? All from my own experiences. They all really did happen, although for the sake of brevity and to help the reader contextualize some have been tweaked while others are an amalgam of more than one story. When I first went deep sea as an apprentice. I found reading and writing helped pass the non-working time productively on the long hauls between ports and that creative writing helped me stay alert during the 4 hour night-time watches on the bridge. After I left the merchant navy I just kept on writing and have been doing so ever since. And after that …. Book 3 “The Songs and Verses” a compilation of 80 original poems and songs, is already published. Book 2 “On Tropical Islands and Sparkling Seas”, all stories about sailing and my Caribbean years, is almost ready, and I have started mapping out book 4 which will be focused on travel in the southern hemisphere. After that …… well, there’s still many more experiences and adventures about which to write, and many more yet to be lived. Are the stories laid up in chronological order, or sectioned by theme? No. In keeping with the tenet of the series they are random, just as my travels were mostly random based upon whatever seemed to be a good idea at the time. To illustrate just how unpredictable those travels were, I have never yet reached a country which I made a long term plan to reach, and all the countries in which I lived I never meant to do so until largely unplanned circumstances took me there. So the books deliberately reflect the somewhat wayward course the life that inspired them has taken. There is a large environmental novel that incorporates some ancient Anishinaabe prophecies that is already written but awaiting some serious editing. I’ll be blowing the dust off that one when the series is finished. I am also looking at a coffee table publication in collaboration with an excellent British photographer combining some of his pictures with my verse, and beyond that there is even thought of a book four in this series. I look upon this as my retirement career so reckon that as long as I can write, I will. Born 26/02/1953 in London, England. Did not attend university, at 17 obtained deck apprenticeship in British merchant navy. Age 22 left the merchant navy, left England and have never lived there since. 3 Children (one born Canada, two born British Virgin Islands).